One for Rob - D series taken 1980s by a then penfriend of mine who features in the picture. Nigerian appliance with a Dennis pump fitted. I imagine mocal bodywork but possibly by Dennis? Very little Nigerian material on this site. 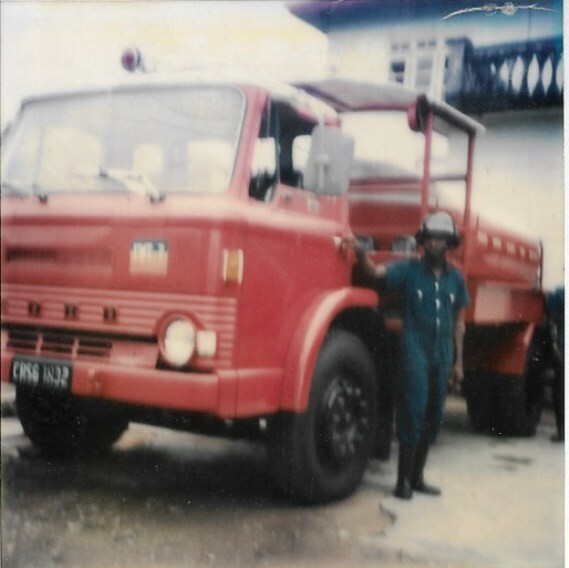 Actually I was involved in selling quite a lot of D series trucks in Nigeria in the early 1970s through our Ford importer there, but I don't know anything about any sold as fire appliances back then. My memory is not perfect these days, but I am sure that we did not send them any SVO fire appliance chassis in those dsys. The local truck body building firms were not very sophisticated, but most of the fire pumps in use were of course British. I would not be surprised if a local firm mounted a (probably) used Dennis pump along with a water tank and some basic bodywork - buying and installing a PTO would have been the only tricky part of the job. The tent arrangement for the crew is certainly not something I could imagine Dennis doing!